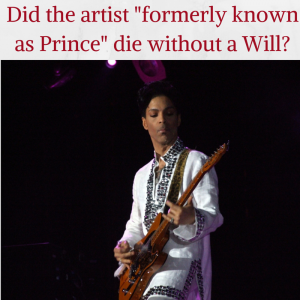 Did "the artist formerly known as Prince" really die without leaving a Will? This is the claim made by his sister Tyka Nelson as she filed documents on Tuesday 26th April with a Minnesota probate court. The documents state that she, Tyka Nelson does not know of the existence of any Will and that therefore the music tycoon has only 6 living heirs – herself and 5 half siblings. Tyka has authorised Bremer Trust – an affiliate of the bank that provided financial services to Prince while he was alive – to manage and supervise Prince’s assets and to determine the identity of all possible heirs. Prince was married and divorced twice, with no children and no surviving spouse, according to his sister. Under Minnesota intestacy law an intestate estate will be passed down to children and grandchildren first, then up to parents, then out to siblings until you find someone who qualifies to inherit. Without a Will or Trust in place anyone with a biological relationship to Prince could come forward as an heir and request a piece of Prince’s fortune. Whether it be a flurry of people asking for paternity tests or even long lost family of a deceased sibling, the whole affair could turn into a frenzied circus. Also without a Will the probate court will need to decide who to appoint as an executor, with the authority to conduct business involving all of Prince’s assets. If Bremer Trust or another bank / solicitor is appointed executor of Prince’s Will it could cost the estate and consequently his beneficiaries’ a fortune. Here in the UK banks will often charge between 3-5% of the value of your estate for their administration costs to gain probate. Solicitors’ firms usually charge less upfront , 1-1.5% – but will charge hourly costs on top of this for their time, their assistants’ time, the sending of emails, letters, phone calls, etc. The costs can soon mount up. The percentage quoted to you at the time that you make your Will may not seem large, but if the value of your estate increases (for example, the value of your house rises), then so will their fees. To find out how to avoid high probate costs read our latest blog. On the other hand if a costly bank or solicitor were not to be an executor, but perhaps a family member, the question is are they well equipped to manage such a huge and possibly complex estate. Prince was a very shrewd business man, and it’s well documented he kept tight control and ownership over the rights to his music so it’s hard to believe that he would be happy with just anyone taking over the control of his estate upon his death. Of course the value of the music legend’s estate is unknown as of yet, however Forbes estimate Prince’s net worth to range from $300 to $500 million. This doesn’t include the value of hundreds of unreleased songs he famously stored in his “vault”. So if Prince did die intestate this saga will be drawn out for a long time to come with expensive family fights in probate court. All of which is open to the public and the world’s press, which for a very private man in life, will be a travesty. It is however possible that Prince did create a Will, the whereabouts of which is just not known as of yet. It’s quite possible that his sister, with whom he was reportedly estranged until recent years, doesn’t know anything about it and is therefore assuming he died intestate. For a very shrewd businessman it seems very strange that this could be a major part of his affairs that he didn’t take control of. Prince Rogers Nelson, better known to the world as Prince died at his home at Paisley Park Minnesota on April 21st 2016. If he did die intestate as his sister is proclaiming his estate will be dealt with according to Minnesota law as detailed above. The ramifications of dying intestate, although differing from country to country, are of a similar theme whether you are a wealthy celebrity or not. To die without making a Will is to create a minefield of potential heartache, hardships, feuds and expenses for the loved ones you leave behind. If you would like specific, tailored advice on making your Will, you can book a FREE consultation with one of our qualified advisors. If you’d like to book a free consultation with one of our legal experts, book online or call 01342 477 102 and quote ‘Prince‘.